Mother’s Day is upon us, and I realised this morning that I did not have anything to put Mum’s gift in. Luckily, I received an order yesterday which had the Scalloped Tag Topper Punch and the Sweet Sorbet designer series paper in. 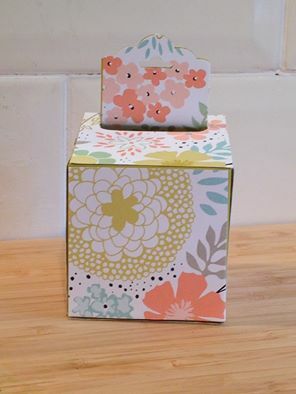 The box is 6″ square and is based on the milk carton designs, but instead of “pinning” the top into the carton shape, I used the Tag Topper Punch on one flap, and then made a slot with the Word Window punch on the other. A little extra cutting is required to make sure that the shaped flap is narrow enough to fit through the slot, but I think it is worth the effort. I used Summer Starfruit card for the box and then covered it with the Sweet Sorbet DSP, which I think is very pretty indeed. After I took the photo, I made a tag with Summer Starfruit card and used the tag punch again, adding a little embellishment and the “To and From” stamp from the Label Love set of stamps. If you love the Sweet Sorbet DSP as much as I do, then you need to act quickly. It is from the Sale-A-Bration catalogue and is free if you order over £45. Beware, though, you have to place your order before midnight on 31st March.